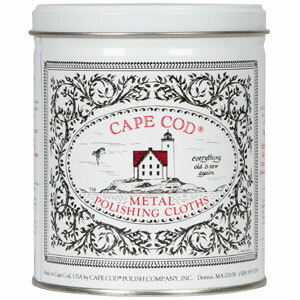 I got this quick Cape Cod Polishing Cloth review from a reader, Tessa. I polish a lot of silver because of my job and by far Cape Cod is the most effective, fast, thorough and easy to use polish! Thanks for your review Tessa! I had not heard of this brand before so I did a little research about it, to learn more. What I found is quite interesting. This brand sells its polish, which is safe for all metals, not just silver, only imbedded within their polishing cloths. The cloths are made from soft cotton, and are reusable. They also have a vanilla fragrance. The product also leaves behind an anti-tarnish finish, which is supposed to help you have to clean these metal items less frequently. The company also have buffing cloths, which are chemical free, for use after you polish your silver items, along with a couple of other items such as buffing brushes. Like I said, the product is for use on many different metals including silver, gold, brass, copper, nickel, pewter, aluminum and stainless steel. I would love to hear from more people who've used this product, sharing how it works for them, good or bad. You can share your review here, or read other silver polish reviews already submitted. 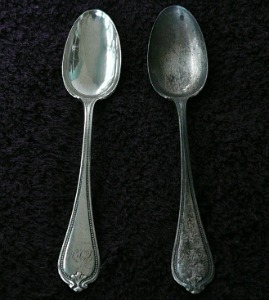 Above is a before and after picture of how this product worked on removing tarnish and polishing a set of sterling silver spoons. As you can see the improvement between the two. The instructions for this product say that you should not try to wash the polish off, but instead to buff it away. However, for those items that you'll then eat food from, such as silverware, to go ahead and afterward wash by hand in mild dish soap, and dry thoroughly. Fantastic!!! I tried to polish my LV lock which had turned super dark and horrible looking and I was going to dispose of it and buy a new one. It was like a miracle! My LV lock looks as good as new!!! I'm going to buy a few tins to put at home. I'm super impressed with it! I was going to send my LV bag with the gold tone brass removed and replaced and that was quoted about $1.1k to replace. The cloth was less than $5! Would have loved to show a before and after picture but I was too lazy to upload it. Will try to do it another time.